This year’s End of the Year list will look a little different from previous lists. For 2013, I’ve asked a few folks to contribute their lists, including Billboard Magazine’s Bill Werde and music technology pundit Jason Herskowitz. Included on this list are some close friends of mine including Mike Caroleo and Andrew Bodenbach. These are in no particular order, with the exception of #1, which is listed last. I didnʼt catch on to this release until later in the year, but wow, it is solid. Ezra Koenig has many interesting things to say about God and religion here, and the music does a notably fantastic job of enhancing his lyrics. Excellent release that should not be looked over. These three sisters from California have written an album that wouldʼve made Fleetwood Mac proud. Itʼs fun, infectious, refreshing indie pop. Iʼve tried turning this album off before, but it never really works because it never stops playing in my head. Haim will deﬁnitely be one to watch develop over the next few years. As someone that was so utterly blown away by the single, “Holding On To You,” I was at first extremely disappointed by the full LP. After later seeing Tyler Joseph & Josh Dun perform these songs live however, my disappointment turned to toleration, and eventually, enthusiasm. With time, Iʼve come to really, really like this album, even if that single still overshadows it. This Brooklyn-based three-pieceʼs debut is overﬂowing and exploding with raw talent. Iʼm going to carry a copy with me everywhere I go in 2014, just in case someone asks me to deﬁne the term “good music.” Seriously, if you donʼt know what Iʼm talking about, you need to stop what youʼre doing and listen. Iʼve been a big fan of these Scotts since The Midnight Organ Fight, and theyʼve outdone themselves with this one. Being a Christian, it hurts to listen to the strong current of anti-Christianity that runs through this album, but Scott Hutchisonʼs genuine honesty and the bandʼs musical prowess remind me I donʼt need to agree with the subject to appreciate the art. Started listening to these guys when I saw they were opening for Manchester Orchestra. You wonʼt ﬁnd any grand production or fancy marketing surrounding the bandʼs two members, but you will ﬁnd some unique, raw songwriting on an album that pleasantly surprised me from ﬁrst listen. Everyoneʼs heard her smash-hit single, “Royals.” Not as many have taken the time to listen to what is one of my favorite mainstream pop albums of the last 5 years. An album of this quality should never be written by someone so young. Itʼs not fair to everyone else. Though theyʼve ﬂown under the radar, The Get Togethers have gotten together 12 songs (one for each month) that really stand strong. And letʼs face it, not many girls that are in bands with their husband can come away with comparisons to Death Cab For Cutie after writing an album about the lesbian teacher-student affair they had in high school, am I right? Iʼll say it: If I had to pick an album of the year, this is it. Iʼm not gonna lie to you and tell you I know what each songʼs about, or that I can even understand every word Matthew Healy sings, but wow. Every song is different from the next, while all still managing to entertain and provide a fresh combination of pop, R&B, 80ʼs rock, and nu gaze. Iʼve literally had to take this album out of my car so that I can listen to something else, but somehow it always ﬁnds its way back to my ears. Top to bottom, I absolutely love it. 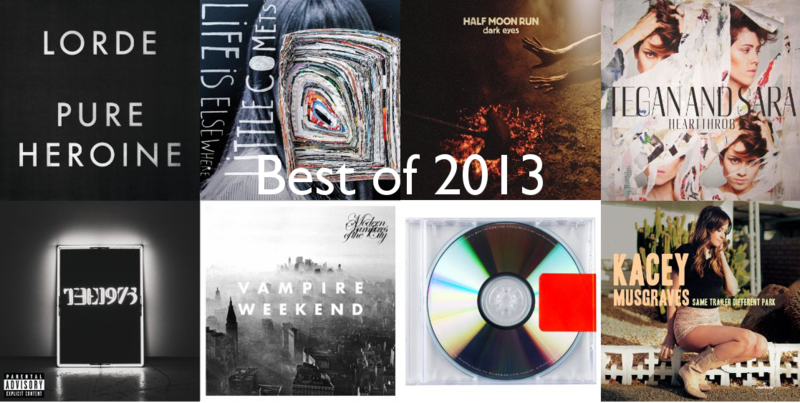 Listen to Mike’s Favorite Songs of 2013 here. Because it’s beautifully shot (not to mention Emma Watson) and nails the moral and social depravity of this generation. Because for the first 2/3 it was what the perfect movie would look like. Because it’s a great look at the anxiety of millenials and it’s very enjoyable to boot. Because it’s Joss Whedon and Co. doing Shakespeare. What else do you need? Because it’s Gravity, but on the ocean and it’s better. Because I’m still in awe. It’s beyond comprehension. And also, Clooney’s voice. Because there is no one who is better at their craft than the Coen Brothers. And this might have been them at their best. Because how can it not be? But seriously, all the talk about movie in the films actually made you feel like you were a part of the family. Which makes the loss of Paul Walker feel like the loss of a real brother.